Yes, it is that time of the year again! Despite it only being September the shops are already stocking Christmas goodies. I wanted to write this blog post after my husband ordered me a new advent calender for the forthcoming festive season. He ordered me the Yankee Candle calender, so with that in mind I thought I would put together a post letting you know all about some of the calenders on the market. 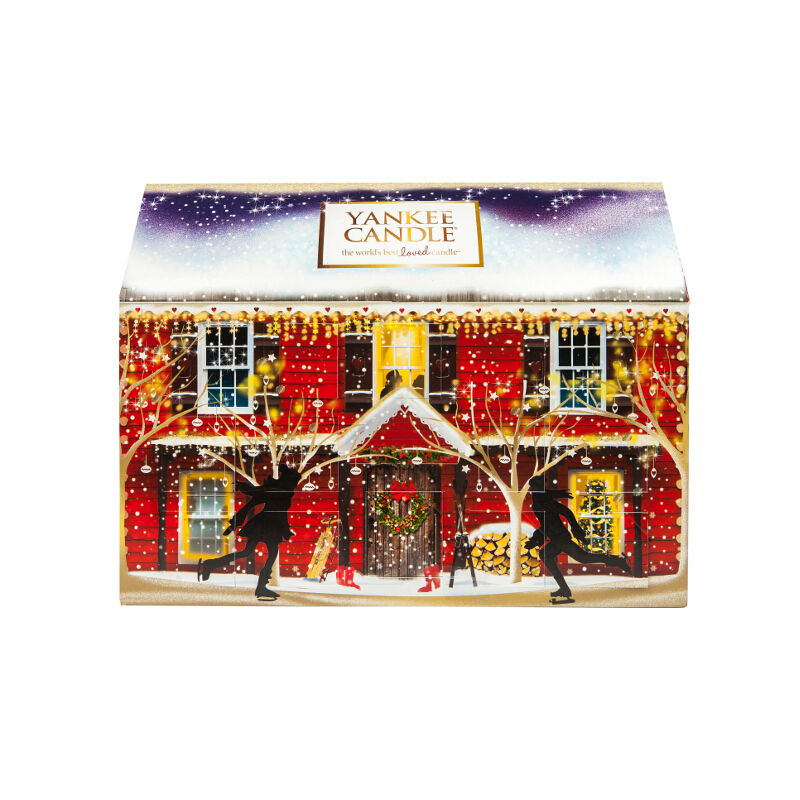 First up is the one my hubby ordered me: This is the Yankee Candle 2015 Advent Calender House. This calender is around the £35 price mark but hubby managed to get it for £25.65. This calender contains tea lights in some amazing festive scents including Candy Cane Lane, Winter Glow, Snowflake Cookie, Icicles, Bundle Up and Spiced Orange. I love candles and burn them every evening so this is a great calender for anyone who loves their home fragrances. Next up is this nail polish calender by Ciate. I have enjoyed Ciate polishes for a while, they do some gorgeous nudes and glitters. The company has released an advent calender for several years now and they have pulled out all the stops for 2015. The Ciate 2015 calender costs £49 and comes with lots of mini polishes including products from their Olivia Palermo X Ciate collection. This Jo Malone calender is very pricey, I gasped at the £260 price tag! It contains mini fragrances and body lotions. I haven't owned a Jo Malone fragrance before but from reading other people's blogs the scents linger on the skin for a long time. So if you are a huge Jo Malone fan perhaps this would be worth the price tag. The calender will be available from Harrods from October and in other stores across the country from November. 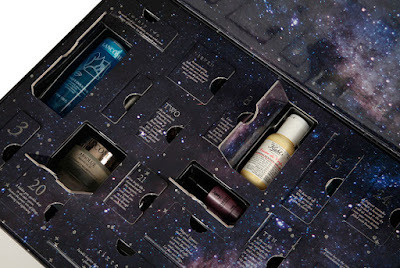 Another fav among bloggers are the Body Shop advent calenders. This year The Body Shop has apparently created two calenders to suit every budget. How thoughtful of them. I believe the calenders will cost £60 and £80. The calenders will contain mini versions of some of their popular products including makeup, scents and skin care. The calender will be on sale from October. This is an exciting calender for 2015. 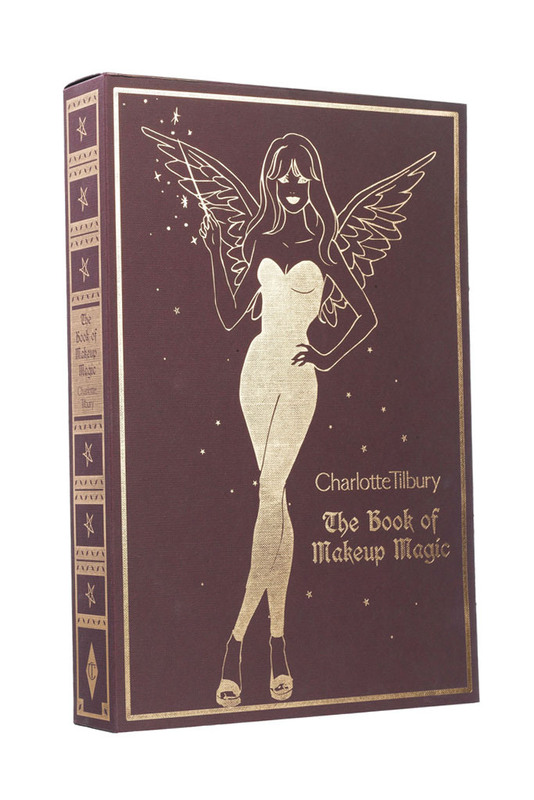 Makeup artist Charlotte Tilbury has released an advent calender called The Book of MakeUp Magic for £150. It contains a mixture of full size and mini size products. 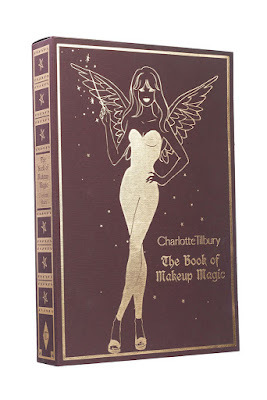 The calender will be available from Charlotte Tilbury's website, Selfridges and Brown Thomas. Benefit has brought out beauty advent calenders for several years now. 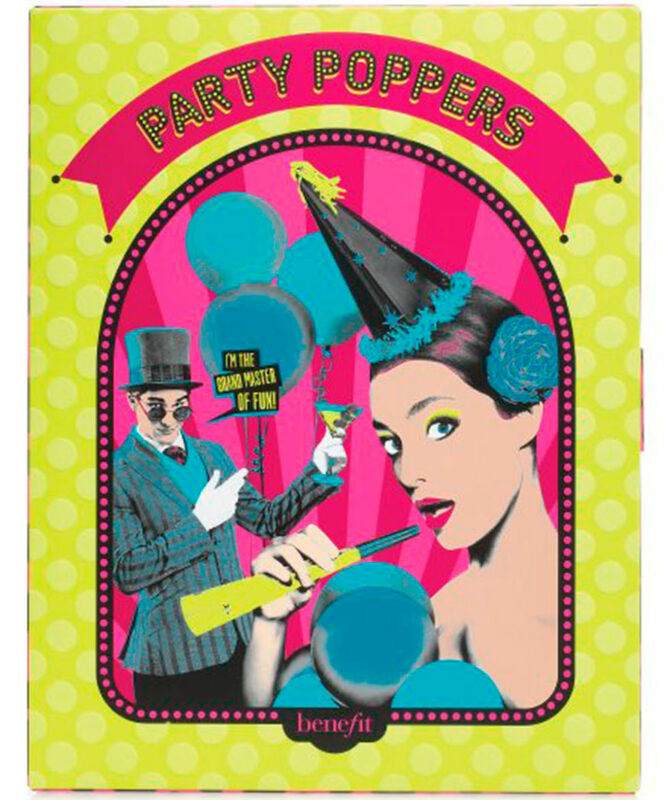 This year the brand will be releasing a 12 door calender for £34.50 called Party Poppers. The company will feature some of its best loved beauty goodies in its calender. The calender will be on sale from Debenhams and Benefit from mid October and nationwide from November. 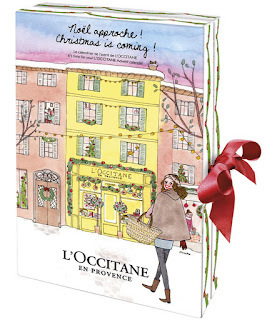 How festive does this advent calender by L'Occitane look. This year the brand will feature 24 mini products behind the calender doors. There will be minis of their skincare, haircare and body goodies. 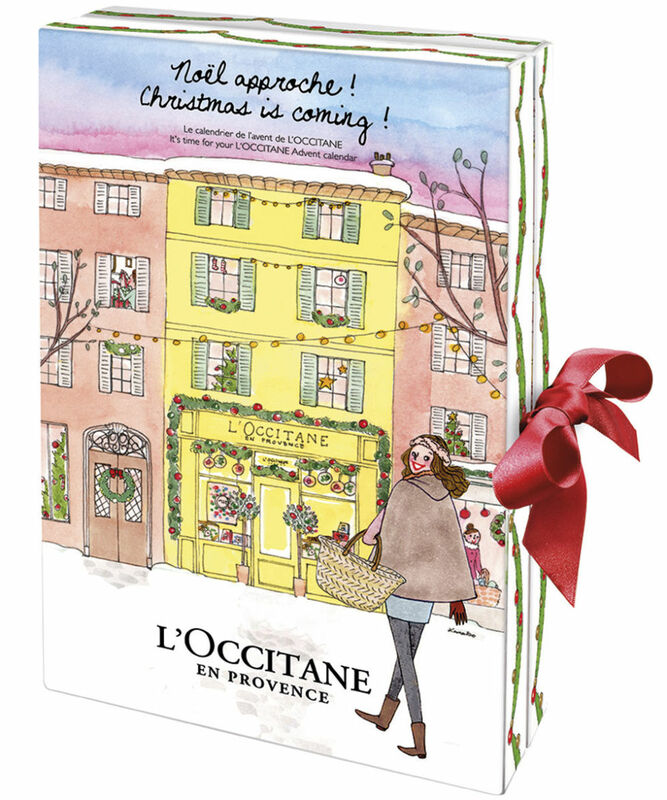 This calender will be on sale from L'Occitane boutiques and online from October 21. Last year I had the Selfridges Beauty Advent Calender and looking at the 2015's offering the products don't look any different. For £95 you get minis of several high end brands inclyding Kielh's, Lancome and YSL. The calender will be on sale from Selfridges from mid October. I am sorry for mentioning the C Word early but we all know these calenders sell out fast. So here is just a little heads up. Now that the evenings are getting darker the house is getting cosier. My fireplace is adorned with candles which flicker gently while the rain beats down outside. A cup of tea and slice of cake is what completes my ideal lazy night in. 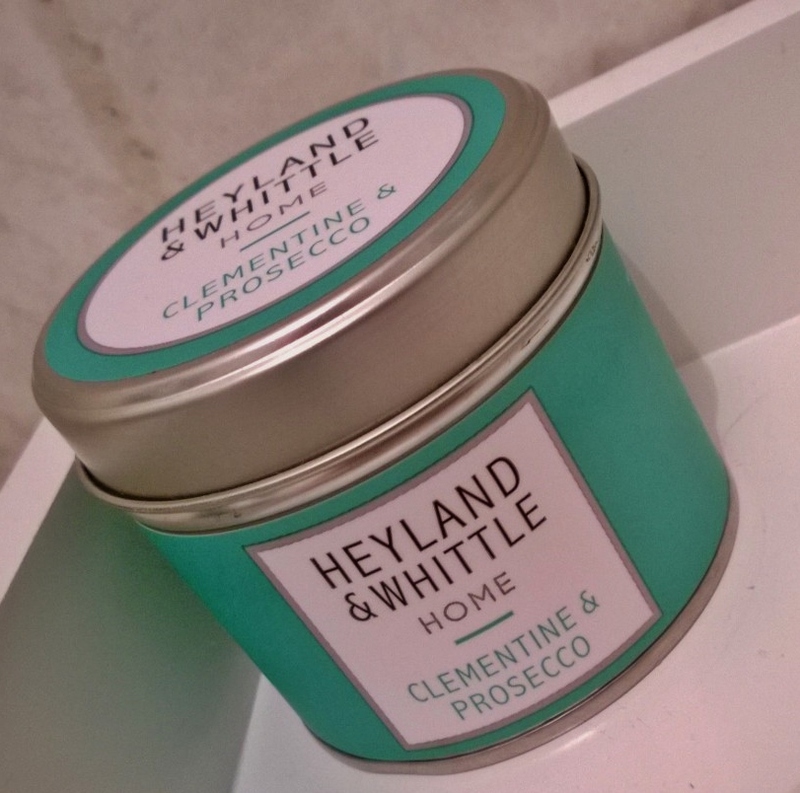 A new candle by Heyland & Whittle has been burning pride of place on my mantlepiece for the last couple of weeks. The company's Clementine and Prosecco candle is quite simply one of the best candle fragrances I have tried in a long time. This is what Heyland & Whittle had to say about their new scent: "With top notes of clementine, sparkling wine, yellow apple and pear, incorporated with middle notes of apricot, peach, plum, and a base note of sugar and dry fruits. "This sweet yet welcomingly sharp fragrance offers the best balance in filling your space with elegance." In the tin the candle smells exactly how I would expect. Mouth watering fruit blended with the fizzy bubbles is divine. The way the company has captured the accurate scent of prosecco amazes me. Once lit the candle filled my whole living room with a sweet fragrance which wasn't too sickly or over powering. This is just one scent Heyland & Whittle offers. They stock a huge variety of scents including Earl Grey, Citrus and Lavender as well as Wild Lemongrass. There are candles in tins which are ideal for travel, candles in glass tumblers as well as reed diffusers. The company also sells soaps, washes and lotions. 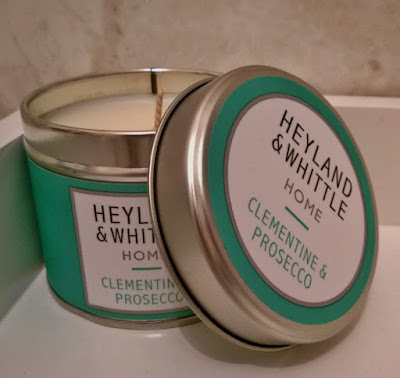 I was sent a sample of the Clementine and Prosecco candle for review, the 180g tin costs £12 while the same scent in a glass tumbler costs £22 for 220g. What are your fav scents for autumn? I never did manage to get the technique of water marble quite right on my nails consistently. However, I did manage to get the technique to work in order to create my own jewellery using nail polish. I used these neon colours by Colour Club to create a water marble ring. The colours (from left to right) are Warhol, Almost Famous, WHAM! POW! and Pucci-licious. I also filmed the process as I think it is easier to watch a video step by step rather than trying to explain in in a blog post. Would you try to make your own jewellery? If so comment down below, I would love to hear from you. As I write this the sunshine is cracking the pavements here in the UK so I am aware that today's post is somewhat out of season. However, there are no rules in blogging or beauty, right? In the middle of summer I bring to you a snowflake stamping manicure. I am terrible at art of any kind so when I give myself a manicure I need a bit of a helping hand when it comes to nail art. That's why I have been such a fan of the Konad stamping system for several years now. The snowflakes are just one design on the M59 while the nail polishes are Beth's Blue by Models Own and For Audrey by China Glaze. So while everyone else is rocking their neon colours at the moment there is little old me in the corner using snowflakes. Here is my video on how I created this manicure. America's largest lingerie retailer has landed in the UK with stores in several cities. I was in Birmingham recently and couldn't resist making a cheeky purchase from the store. There were offers on undies in the Pink line as well as fragrance and bodycare in the Victoria's Secret line. The undies are lace topped boy short style which are comfortable yet stylish with their bright neon shades. These were five for £20. Thinking back I probably should have stocked up on more. However, I have Pink undies which I bought in 2013 when I was in Dubai on honeymoon and they are still going strong. That's the great thing about Victoria's Secret, their garments are good quality and will last. I also picked up some showergels and hand and body creams from the Victoria's Secret bodycare line. These were on offer as well, five for £30. I picked up showergels in the scents: Love Spell, Aqua Kiss and Pure Seduction as well as hand and body creams in Amber Romance and Sheer Love. The showergels are strongly scented, a little goes a long way. You don't need to use a lot in the shower and the scent lingers on the skin for a while. The creams are wonderfully rich, they skin into the skin quickly and are non greasy. Now Victoria's Secret have made the leap to the UK I am hoping fellow American brand Bath and Body Works do the same. Have you bought anything from Victoria's Secret in the UK? I took the plunge and sat infront of my camera to film a nail tutorial for Youtube. It was my first attempt and I have a lot to learn. 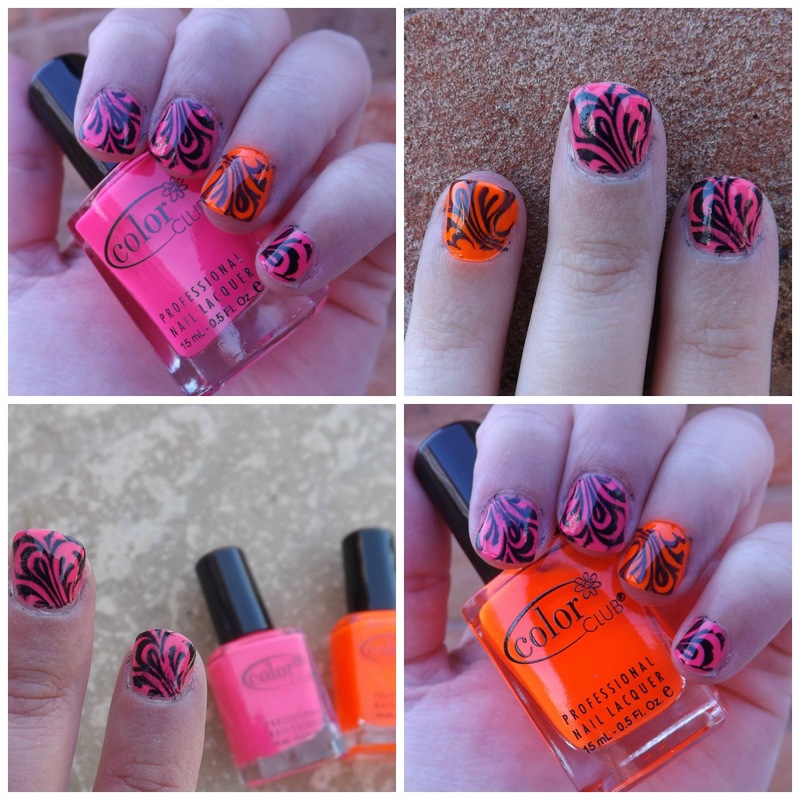 I filmed a Konad nail stamping tutorial using some neon pink and orange polishes from Color Club. A lot of people will be familiar with the Konad nail stamping kits, but if not please click on my video below which explains the system. I have also shown step by step how the process works. For this manicure I used Recondition as a base coat from Seche Vite. 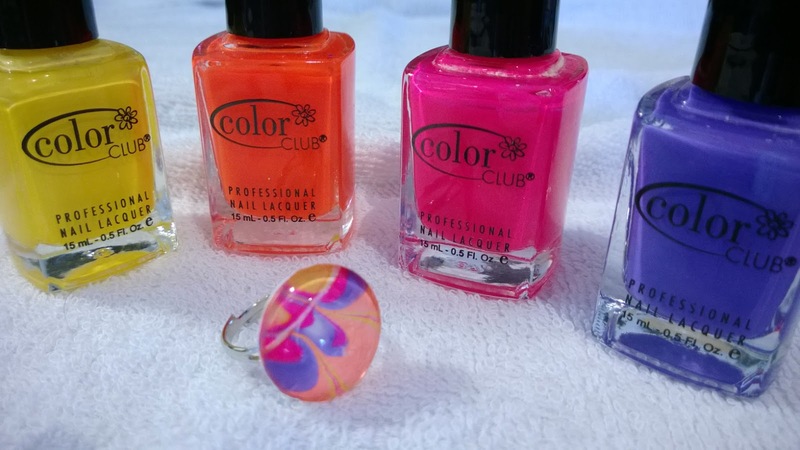 The Color Club neon pink is called Jackie Oh while the neon orange is Koo Koo Ka Choo. Well done to Color Club for the amazing nail polish names. I also used Konad plate M63 which features several full nail templates. Here is my first nail art video attempt. I love visiting new cafes and restaurants in my town and supporting independent businesses. Any new cafe which serves hearty portions of cake will grab my attention. 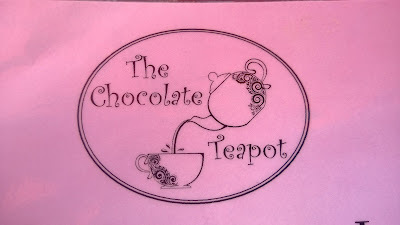 After a bit of buzz on Facebook a new cafe called The Chocolate Teapot opened earlier this month. It was this chocolate dipping platter which caught my eye. This chocolate sharing platter (£4.95) came with a pot of white chocolate and milk chocolate sauce. The goodies to dip included flapjack, rice-crispy treats, marshmallows, strawberries, chocolate brownie, cinder toffee chunks and a chocolate pencil. The platter was lovely, just enough to satisfy my sweet tooth craving, it went down nicely with this hot chocolate which was around £2. 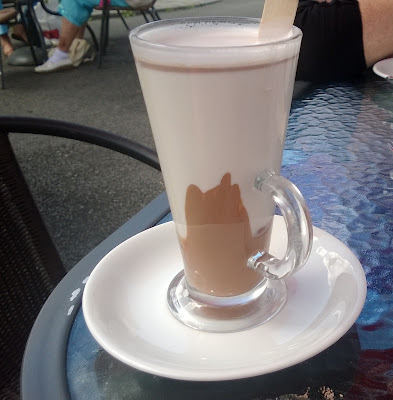 The hot chocolate consisted of warm milk with liquid chocolate drizzled at the bottom of the glass. It came with a wooden spoon to stir the liquid chocolate with the milk to create a smooth, sweet and creamy drink. I also had a prawn sandwich before all the sweet treats (£3.95) while my husband had a toasted sandwich. An observation in terms of service was that it would have been nice to be offered condiments especially with the toasted sandwich. The cafe itself has lovely outside seating area which seemed popular with mums and pushchairs. We took Joshua down and sat outside to eat out lunch, he was happy watching the world go by before having his bottle. The Chocolate Teapot's menu has a lot of variety and there were some lovely fresh cakes on the counter to choose from. I was impressed they even had gluten free options which a lot of places don't cater for. I am also eyeing up the Ultimate Hot Chocolate which consists of hot milk and a chocolate cup with Belgian chocolate buttons. 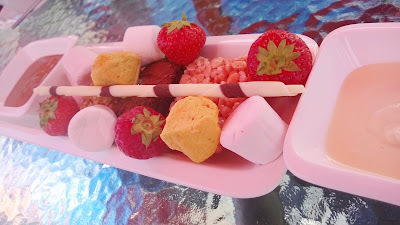 You can melt the chocolate in the milk, this kind of DIY is right up my street. 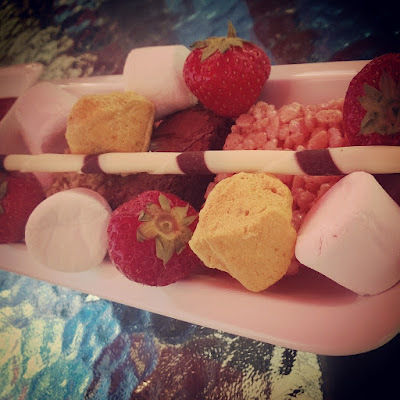 The drink also comes with fudge, salted caramel and chocolate as well as a biscuit and marshmallows. All in all a lovely place with friendly staff and wide variety of food, drink and delicious cakes.